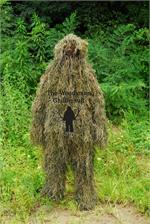 This NEW Woodland blended synthetic thread is the same thread we use in our kits, and our Light weight Ghillie suits. Our All-Season, or Woodland jacket and Pants set is made with this same thread. Pre-blended to save you time if your building a woodland ghillie suit, Blanket, Rifle wrap, or adding to your current suit. Sold by the one half pound.